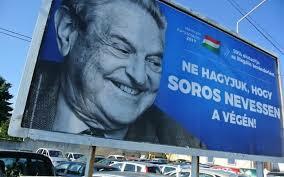 George Soros is considered by many Israelis to be a traitor to the Jewish people. He was not a victim of Holocaust. He was, at best, forced to collaborate with Nazi's as a young man. He was, at worse, a willing collaborator. Soros has constantly promoted groups that are trying to destroy Israel and harm the Jewish people. He is "Jewish" in the same way that Karl Marx was Jewish. He is no lover of the Jewish people or the State of Israel. Siding against him with European leaders who in reality (not merely in vague talk) support Israel is a good thing, not a bad thing. Increasingly few Jews in Europe support Muslim immigration now that they have seen what it means for the Jews. Currently, most American Jews are more naive with respect to immigration of Jew-haters. While Evangelicals may have their own interpretation of "End Times," I will take that over the much more pressing interpretation of "Now Times" advocated by Muslims and Leftists who are hostile to Jews.